Oh god, this thing is a beast of an upgrade card. It does strange things and required a FAQ from pretty much the moment it was announced, and even after the FAQ it isn't 100% clear exactly how it should work, though I will describe the basic consensus. Anyways, here it is! Before deploying fleets, you may set aside a number of friendly squadrons up to your squadron value next to your ship card. Squadron Command: For each squadron you would activate with this command, you may instead place 1 of your set-aside squadrons within distance 1. It cannot move this activation. So, in other words, the consensus ruling at the moment seems to be as follows: Supposing you had a Squadron Value of 4, you can set aside 4 squadrons prior to deploying your fleet. Then, when you perform a squadron command (dial), you can place your 4 squadrons (or less!) and then activate them to shoot. Or you could place them and not activate them, allowing them to move on a later activation. The choice is yours! The best use for this seems to be for delivering slow fighters safely and unengaged to the fight, preferably after the enemy's interceptor force is already engaged. B-Wings or other slow Rebel ships seem to be the most effective use for this card, though the Imperials may have some luck using this with either low hull squadrons like Interceptors, or on a Speed 3 carrier with Firesprays, as Rogue would let them move / shoot in the squadron phase after being deployed. Of these, only the Assault Frigate, ISD, and flotillas can go Speed 3, and only the Raider can make Speed 4. 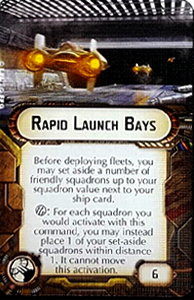 It should be noted, that putting the squadrons aside for use with Rapid Launch Bay reduces your deployment advantage. It should also be noted that you can bring a LOT of things in a Hyperspace Assault by using Rapid Launch Bay to bring in even more fighters over and above the 3 the objective will let you bring. It should also be noted that based on yet another email clarification from after the FAQ was published, it appears you can dump the squadrons set aside by the RLBs and then activate a completely different group of squadrons. It also appears that if something other than the RLB ship activates the dumped squadrons, those squadrons can move as normal. Yes, this card is that crazy convoluted. That is why I do not like this card and never plan on using it. Tp be honest this card was perfectly clear from the begining and FAQ was not required. I'm pretty sure that no one was on Team Oranpleish-Green from the very beginning. I had the same thought, but it would involve splitting your forces into several groups. It would take lots and lots of practice to get the timing down, and it would still be pretty easy for the enemy to maneuver out of the trap. I have often thought of the Marg Sabl too, but fighters just don't have enough punch to be able to do it, and enemy squadrons will be able to respond rather quickly if any are nearby. All it takes is one non-heavy squadron to prevent all of your bombers from causing furthur damage. Probably the best way to accomplish unengaged squadrons is to dump as the final activation, and then squadron activate with Rogues.
" (...)or on a Speed 3 carrier with Firesprays, as Rogue would let them move / shoot in the squadron phase after being deployed." "It cannot move this activation." Incorrect. 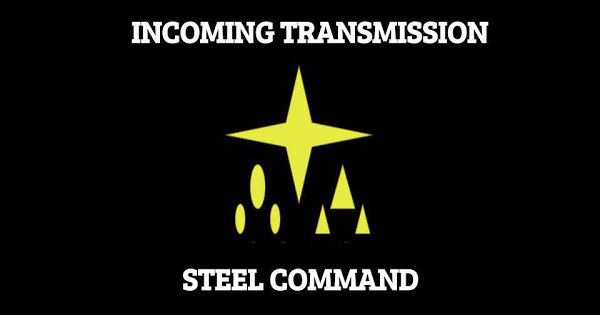 As long as the ship that is dumping the squadrons does not activate them, it is a completely different activation. So you CAN dump a bunch of rogues and hope they make it un-engaged into the Squadron phase for move/shoot shenanigans.